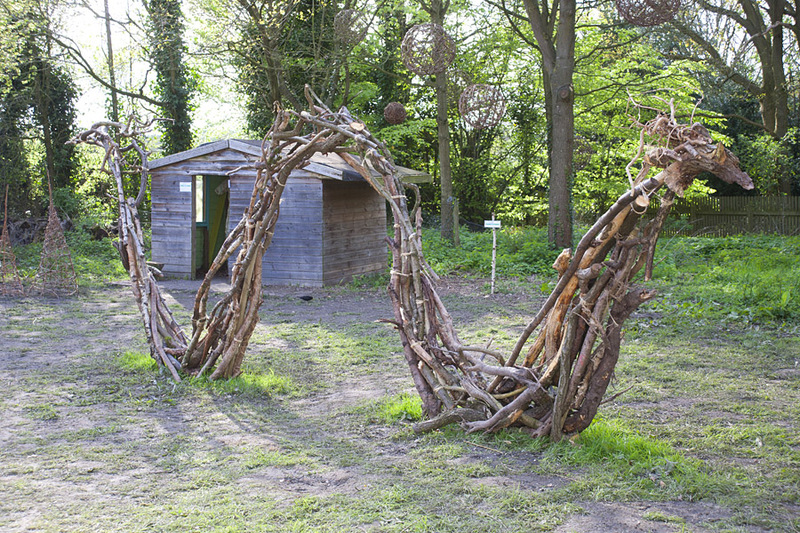 Get creative this Spring with free drop-in workshops at the Into The Outwoods Sculpture Trail ! 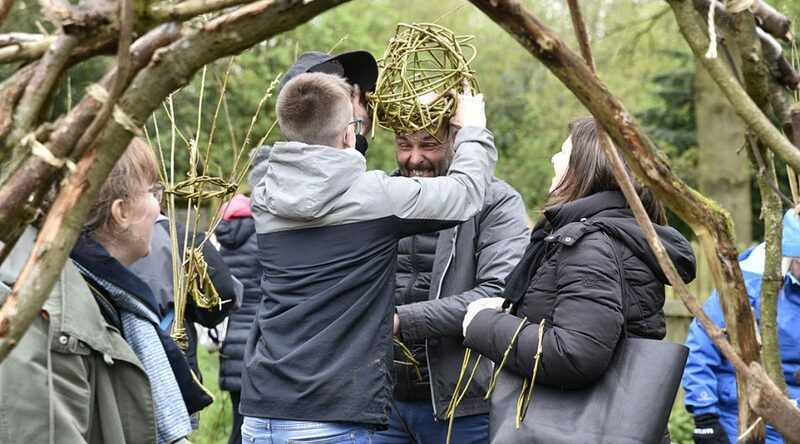 ArtSpace are inviting the public to come along to the Loughborough Outwoods at the end of April and get creative in a series of free sculpture drop-in workshops. 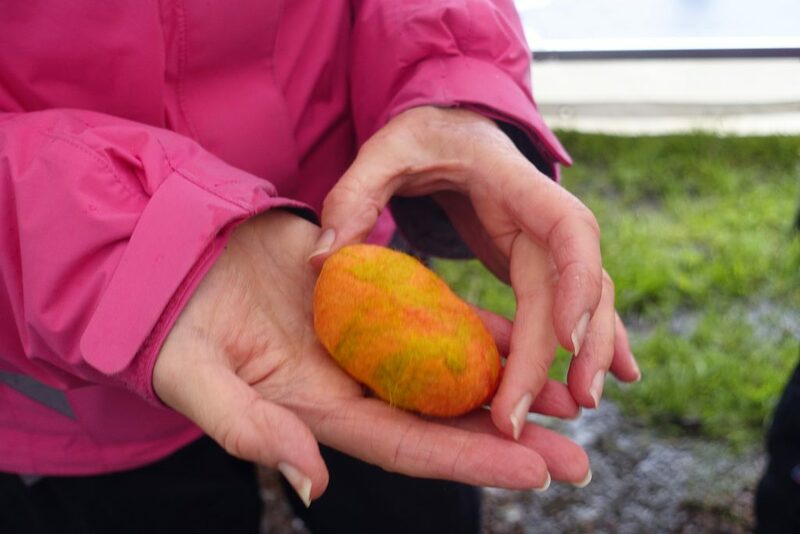 Try felting a pebble or making a one off monoprint from natural woodland materials. You will also be able to make your own loom and weave a star and have a go at making willow structures using the ‘random weave technique’. The full program for the weekend worshops is given at the end of this post. Keeper of the Woods from the 2018 event. 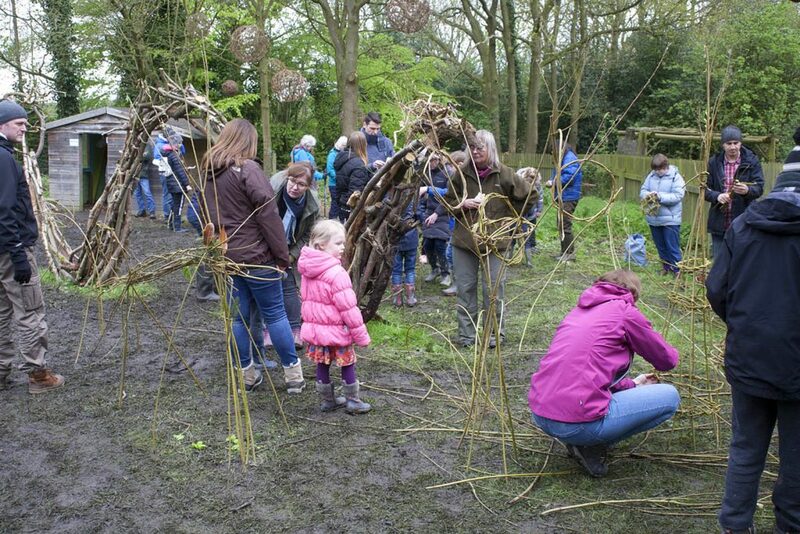 The workshops are all part of the Into The Outwoods Sculpture Trail, an ArtSpace initiative which will see a 1 1/4 mile sculpture trail weave its way through the Outwoods for 6 weeks, from 27th April to 9th June. 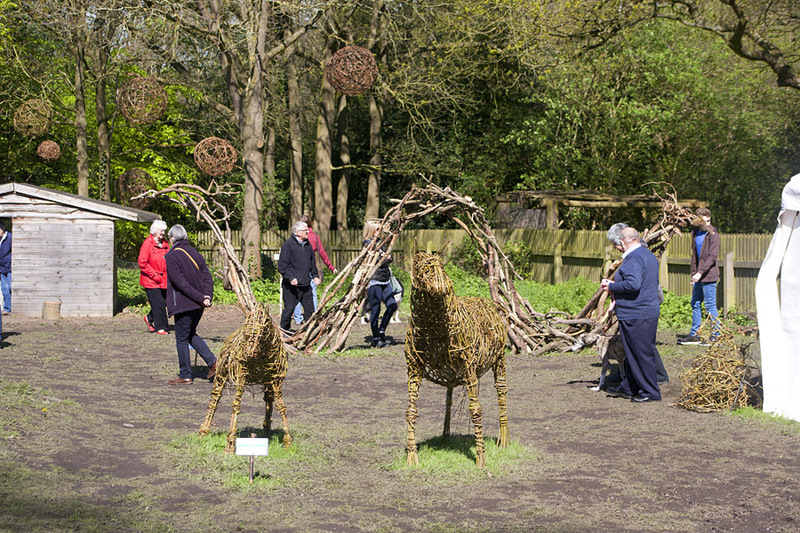 Find the ‘Keeper of the Woods’, giant felted bluebells, willow tree spheres, an owl, jumping willow horse and much more! Twelve commissioned artists will be creating and installing their work in the woods over the Easter holiday period, 15-26th April, allowing visitors to observe the process and talk with the artists. Work will be figurative as well as abstract using natural materials, felt, willow, ceramic and metal. The opening event for the sculpture trail on the 27th and 28th April will include two days of free public drop-in workshops. 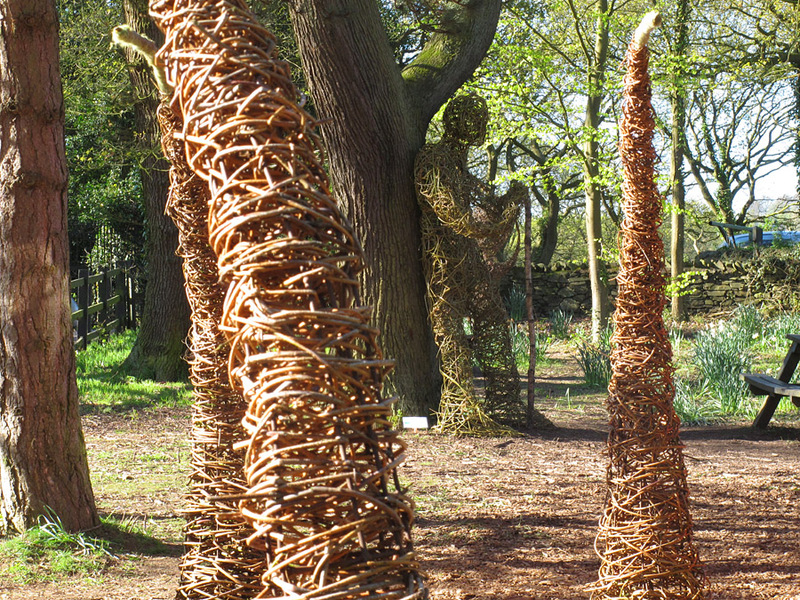 There will be further workshops held during a ‘Sculpture in the Woods Day’ on 27th May, where four day-long drop-in trail-based workshops will allow visitors to both make work to take home as well as work on a larger collaborative piece to remain on the trail. 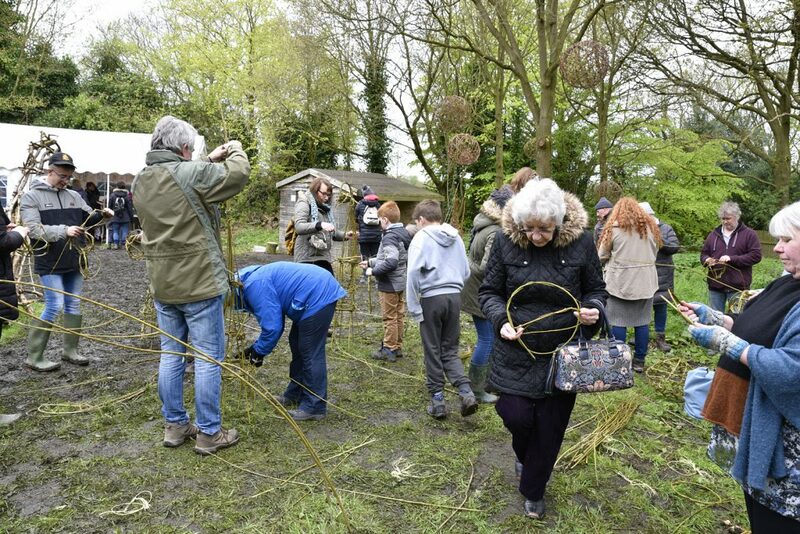 Workshops will aim to inspire, engage and challenge adults, young people and children, enhancing their opportunity to experience and be inspired by the sculpture trail and reconnect with this ancient woodland. 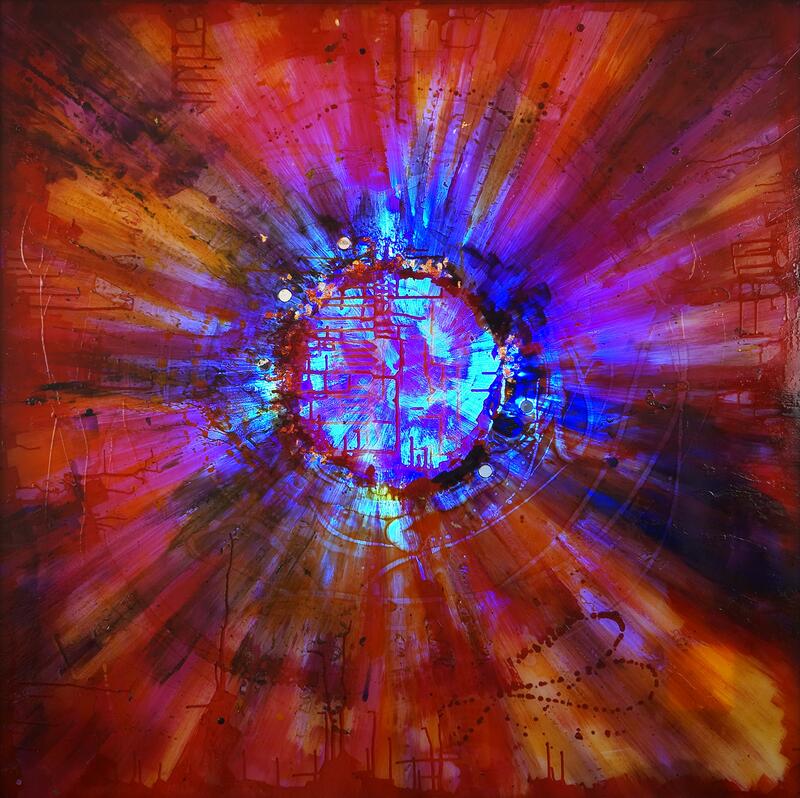 Unity of Time by Nita Rao. ArtSpace are a Charnwood based group of professional and semi-professional artists that formed in 1997. The Project has been generously supported by Arts Council England, The National Forest and Charnwood Borough Council. Using objects found during a walk in the woods – branches, leaves, seeds, stones, bark, grasses – we will create small hanging mobiles for you to take home. We can combine threads and any unnatural objects you find on your walk that you think will complement your ideas – bottle tops or pottery fragments for example. Easily adapted for any age, this is a workshop that everyone can be involved in and a lovely way to display small mementoes you find on your afternoon walk. 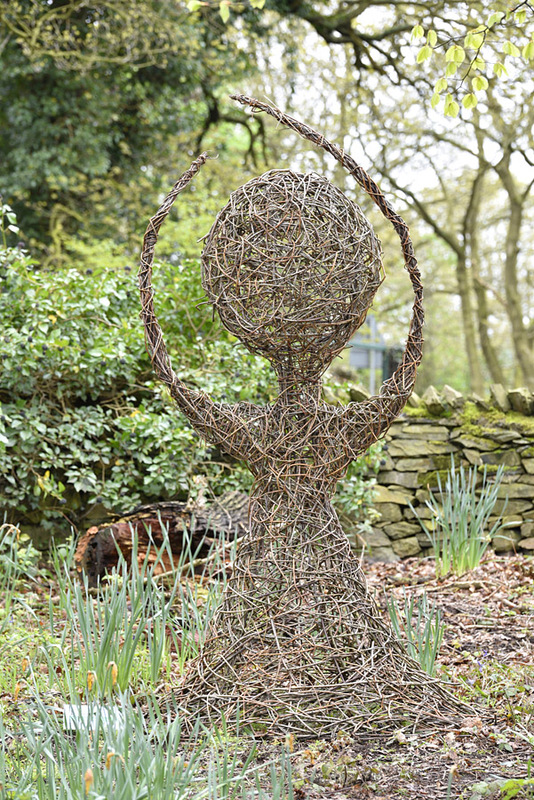 Create a willow structure using the ‘random weave technique’. Suitable for families and adults. They take about an hour, so you will need some patience. Using a selection of foliage and other found objects, in this workshop you will be able to produce a printed image using both relief printing and monoprinting. Messy but great fun. Suitable for all ages. Drop in and have a go at making something with felt. Get a taste of how felting works, and make something to take home with you. Experiment with hand wet felting around a small stone using dyed wool tops to create your own special felted stone paper weight. Have a go at making a small colourful ‘feather’ using dyed wool tops. See how the colours mix together to create your unique feather shape. Activity suitable for children age 6yrs plus accompanied by an adult. Make a weaving loom, or frame, from a hoop of willow, and weave into and across this with wool, yarn, and any interesting ‘found’ bits of natures discards. This will result in a totally unique circular artwork which could be hung in your home or garden. Hanging from trees, these creations look like Natures eyes! Suitable for all ages. Using a selection of foliage and other found objects, in this workshop you will be able to produce a printed image using both relief printing and monoprinting. Messy but great fun. Suitable for all ages. ArtSpace have won national funding to stage the biggest woodland art event to happen in Charnwood for decades, perhaps ever! Mountsorrel artist Nita Rao, main creator behind the event, has undertaken an 8 week ‘artist residency’ in the spectacular woodland setting to wet the public appetite and set the scene. This will be followed by a six week long sculpture trail leading through the woodland featuring artworks from eleven commissioned artists. Some of Nita’s work at last years Into The Outwoods Sculpture Week. 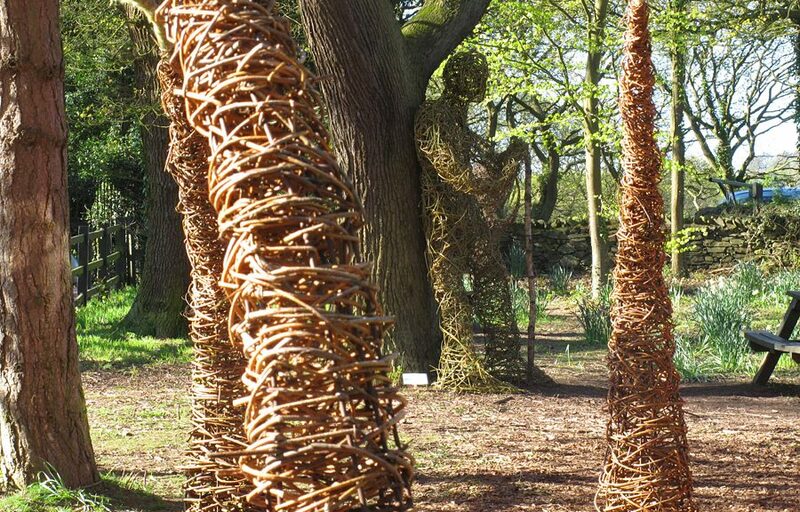 The Sculpture Trail in Charnwood’s Outwoods, just outside Loughborough, will be opened with a weekend art event, including free creative drop-in workshops for the public, on 27th and 28th April. 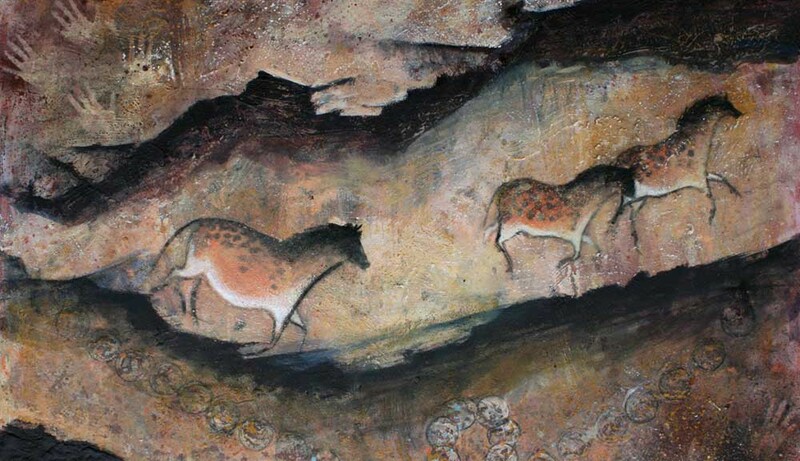 The Trail will be open until the 9th June. Nita’s residency started on 18th February and will continue until the opening of the Sculpture Trail. Last years Into The Outwoods Sculpture Week. As artist in residence, Nita will spend 2 or 3 days a week developing new work in the woods from natural and found materials, taking inspiration from the Outwoods itself. 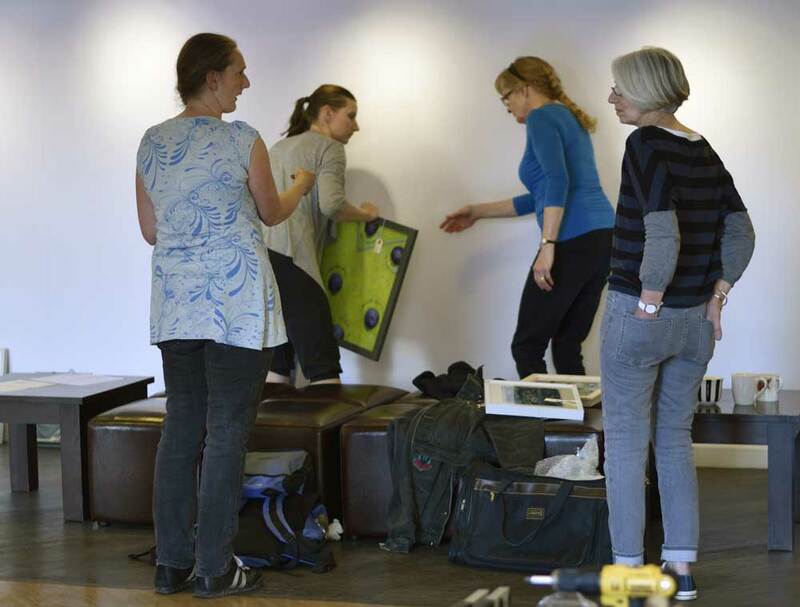 The eleven commissioned artists will be creating and installing their work on site over the Easter holiday period, 15-26th April, allowing visitors to observe the process and talk with the artists. Drop-in felt workshop at last years Into The Outwoods Sculpture Week.. The opening event for the Sculpture Trail will include two days of free public drop-in workshops developed in response to work in the trail. During the six week trail further free workshops will be held during a ‘sculpture-in-the-woods day’. Four day-long drop-in trail-based workshops will allow visitors to make work to take home as well as work on a larger collaborative piece to remain on the trail. Drop-in willow workshop at last years Into The Outwoods Sculpture Week.. The Project has been generously supported by Arts Council England, The National Forest and Charnwood Borough Council. 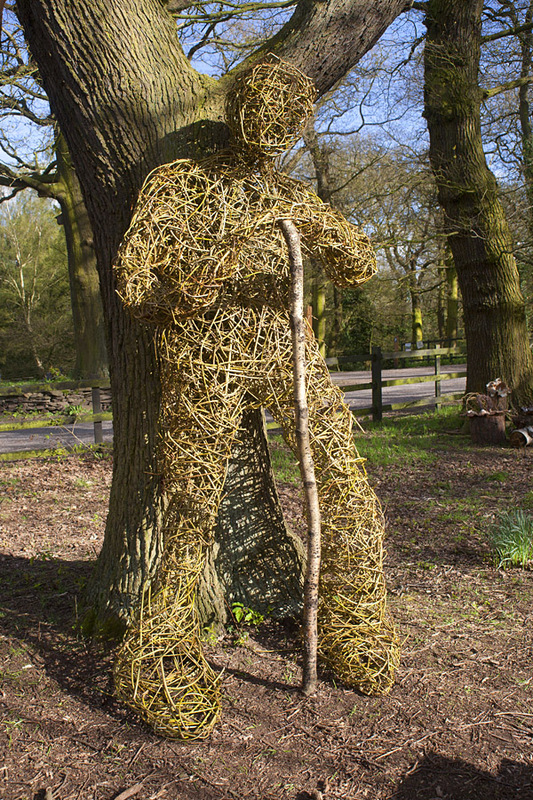 For further updated information see facebook – Into the Outwoods Sculpture Trail. 18 members of the artists’ group Artspace Loughborough explore the theme of ‘Odyssey’. 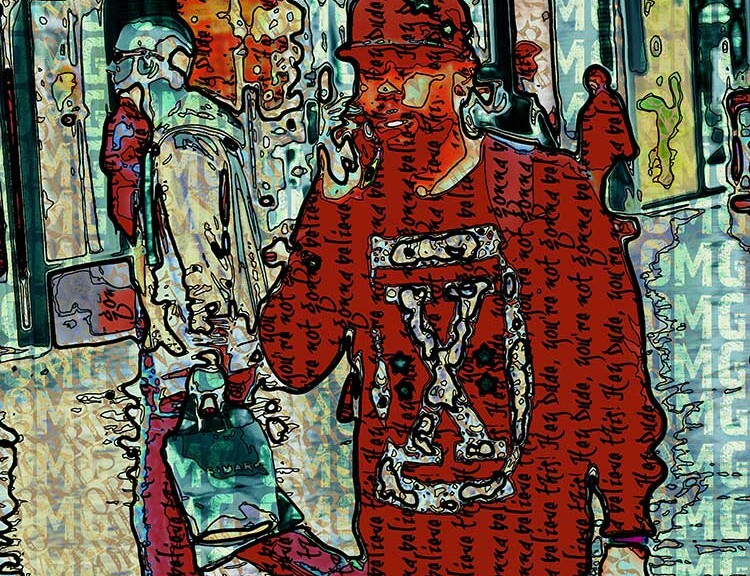 Each artist has responded differently and with a variety of media to the theme of a journey. 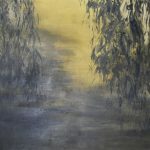 Several artists have chosen to explore actual journeys: narrow boat journeys in central England, photos from a train in India, the journeys of refugees to a safer life, Australian aboriginal songlines, wallpaper seen in an old cottage in New Zealand, shoes and other objects that remind us of travel. Some journeys are imagined: the possible aftermath of a shipwreck, the exploits of a travelling circus. 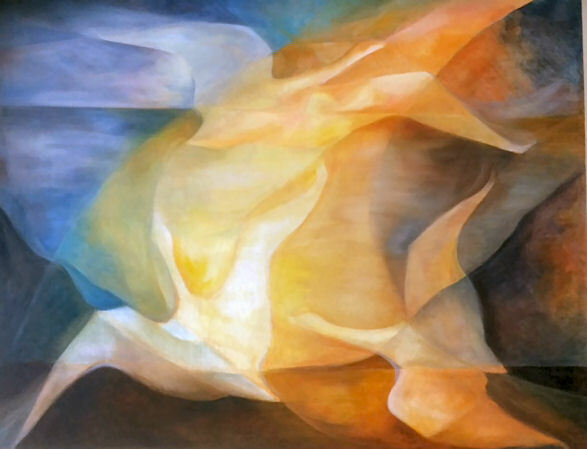 Other work has a more metaphorical quality: the artist’s own journey to develop their art or to find meaning. 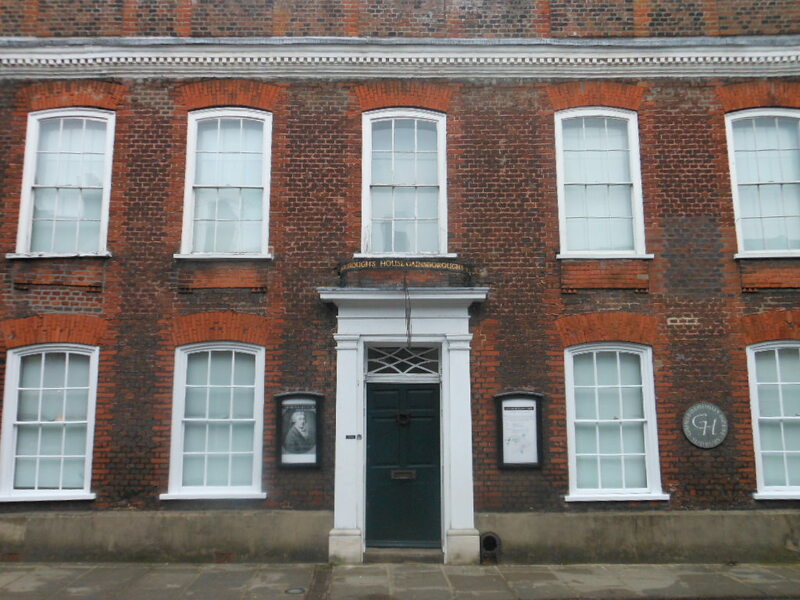 I went to Sudbury, Suffolk recently, to see Gainsborough’s house. Very interesting – we devised a slightly alternative version of his life, piecing together the concrete information. I reckon he had quite a stressful working life, going to London early on (the right place for middle-class patrons) – whilst there he would have been obliged to get a posh studio in the right area whether he could afford it or not – posh clients wouldn’t want to be seen in a poor area. Then he went to Bath – maybe that was a bit cheaper, but still posh – we wondered why he moved? Then he returned to Sudbury and we wondered if that meant difficulties, not only in terms of making ends meet, but also he wasn’t entirely in line with Joshua Reynolds, the first principle of the R.A. Looks like his brother (who had made enough money to live elsewhere) moved out and allowed him & family to live in the house their father had originally bought. Looks like Gainsborough felt under pressure to keep up appearances as it were, and we did notice an increase of more ordinary local people in later portraits, so maybe he felt he had to take whatever work he could. What really inspired him though was aristocratic ladies with a bit of va-va-vroom, like ‘Mary, Countess Howe’ – now there was a fabulous woman! I have been a member of Artspace Loughborough for a decade now having been a member, moving abroad, and come back so I thought it apt to write a few lines about belonging to an art group. As artists, we tend to work in a fairly solitary manner. However in order to evolve, it is essential we communicate with like-minded people every so often, to support one another and divulge ideas. One thing which I particularly like about being part of the group, is the diversity of the work of our group members. We often have positive critiquing sessions before we collectively exhibit. These are useful, insightful meetings where we show our work, conceptually, part way through, or finished and talk it through with others. We all share a common interest which is a love of art in all of its’ forms. I highly recommend to anyone who is considering it. Find your tribe and stick to them. This is a fabulous retrospective of ben Nicholson’s first wife at Djanogly Gallery at Nottingham University. First and foremost she was a terrific colourist, and also as an older person I found her inspirational as she remained so inspired, positive and interested in all things beautiful. Her subjects are often flowers, typically in a jar on a window sill, but then she was left with four children to look after while Ben went off with Barbara Hepworth – so are we surprised her subjects are often home-based? Anyway, I found the colour a real WOW! It’s inspirational, and her flowers are thick gutsy affairs, playing beautifully against the immediate surroundings. There are also her letters (nice friendly open handwriting). This show lifts the spirits – and it’s free. 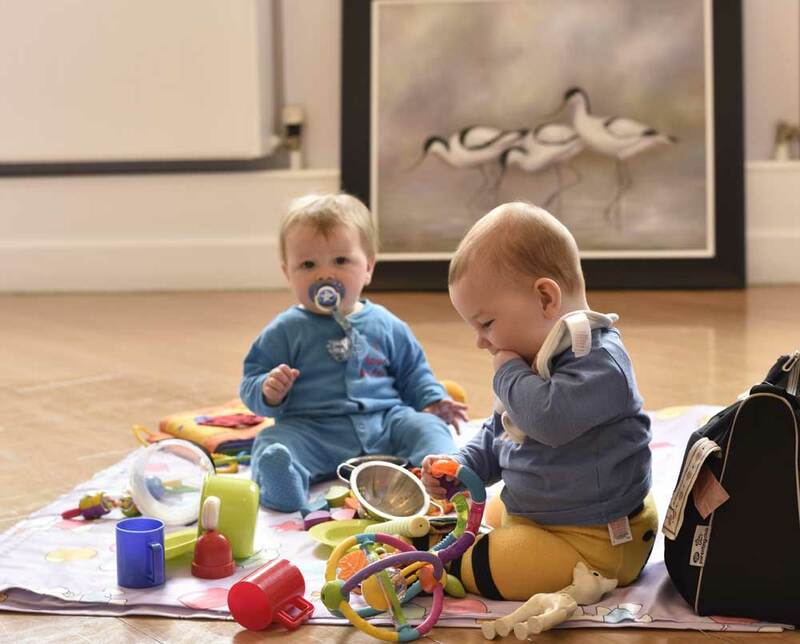 The curation and hanging teams have done a fantastic job (even the babies were quiet, letting their mums help) – why not visit the gallery and see for yourself? 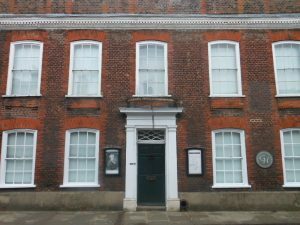 Our new exhibition, Beyond Words, will be opening at the Sock Gallery, Loughborough Town Hall, on Friday 15th May. The exhibition will run until 27th June, Monday through Saturday, 9am – 5pm; closed Sunday. 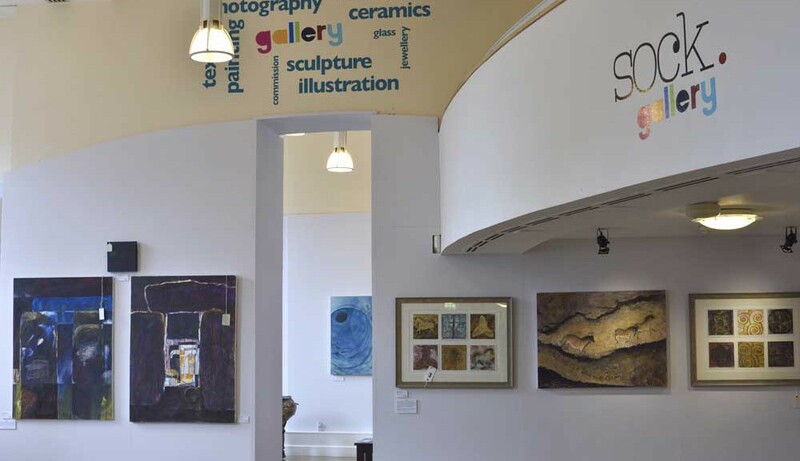 You are welcome to meet the artists at the Sock Gallery on Saturday 16th May between 1pm and 3pm. Just come back from sunny Corwall. Went to 2 great exhibitions. One was at Kestle Barton gallery near Helson. An exhibition of Roger Ackling’s Sun Histories which was exciting and all done using a magnifying glass and the sun to scorch wood. A lovely garden and a cafe with an honesty box if you are thirsty after walking Frenchman’s Creek. 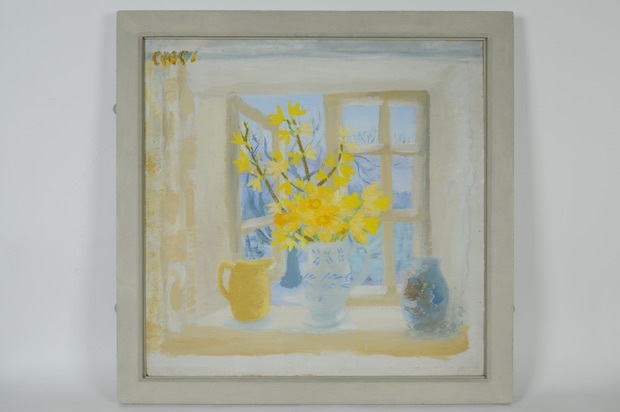 The other was at the Lemon Street Gallery in Truro. Neil Canning. Very much my sort of thing and wonderfully monochrome with great splashes of vivid colour.